ZAK CHELLI SAYS it was his desire to be considered Frank Warren’s super middleweight priority that prompted his wish to take on fellow prospect Umar Sadiq at the Brentwood Centre on October 20. The pair get it on in a battle of the unbeatens, live on BT Sport, on a card headed by Anthony Yarde taking on Walter Gabriel Sequeira, while Gary Corcoran and Johnny Garton compete for the vacant British welterweight title. Chelli, just 20, is a young man on a mission and in no mood to take the slow lane towards major title contention. Just four fights in, he is ready to take on a 6ft 3″ stylist who is ten years his senior. Not only that, he asked for the fight as soon as he got wind of a divisional rival from Ilford. “Basically, I’ve always wanted to step up and I’ve actually wanted to fight him from when I first heard about him,” revealed the Fulham banger. “I knew Frank Warren had another super middleweight and I wanted to be the only one in the category when I started off. “I thought he was taking my fights! “I called the matchmaker and said I was crying out to prove I am better than him, but he said it was too early and he was not ready for this fight, bla, bla. “Then, a couple of months later, I got the call to say he wants to fight and I was like ‘ok, I accept it’. Chelli added that the age difference doesn’t matter in this fight because, as far as he is concerned, age doesn’t equate to experience for Sadiq, who he believes still retains amateur habits. “I was surprised to find he is 30 years old and just starting his career now. I think his prime was when he was in the amateurs, so maybe he has got a bit worse now. Anthony Yarde will be headlining the Brentwood Centre on October 20th when he faces Argentinian Walter Gabriel Sequeira. World title challenger Gary Corcoran and ‘The Pexican’ Johnny Garton will contest the vacant British welterweight title. 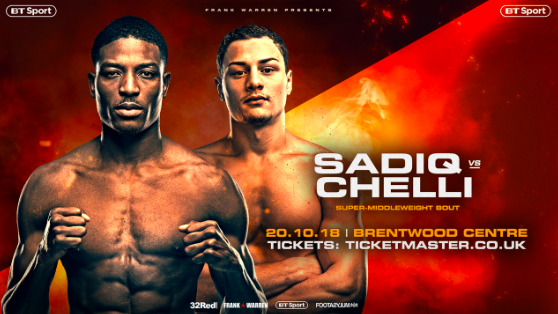 Zak Chelli and Umar Sadiq will both be putting their young, undefeated records on the line in a super-middleweight contest. Heavyweight Nathan Gorman will also feature on the show televised live on BT Sport. Tickets are priced at £40, £100, £150 and are available to purchase from Ticketmaster.